During the snowy winter months, not much can top skiing, or its cousin snowboarding, for thrills, fresh air, and good times with family and friends. Like many sports that offer its type of excitement and challenge, skiing is not without its risks of injury. A well-planned approach to getting involved in this activity is a must, especially for children, but the effort will be well worth the pleasure from a sport that lasts a lifetime. Whether you choose skiing or snowboarding, you are in for a world of fun. Skiing is a great family activity. The natural curiosity, lack of fear, love of excitement, and desire kids have to expend energy together make them great students for skiing or snowboarding. In fact, we could all learn something from the pink-nose little skiers. They try nearly anything they are asked, have the desire to listen and learn, and when they fall, they just dust off the fluffy stuff and get right back to the matter at hand. As mentioned earlier, having a safe approach to learning is the way to go, and no better way to get started than to enroll your little one in ski school. Professional children’s ski instructors are strongly advised when getting started. Children can start skiing as early as 4-5 years old, depending on the school or instructor. There are even programs for children younger in some of the bigger resort or vacation areas that cater to families. Of course, lessons at the outset are a good idea for anyone getting started, regardless of age. Instructors will make the learning experience faster and more enjoyable. Spending the day on the slopes has many benefits for skiers of all levels of experience. There are many choices once you have made the wise decision to learn with an instructor. There are ski schools at most major resorts and slopes. Ski schools will break groups into skill level and similar ages. This is efficient and fun. Private lessons can usually be arranged for individuals or groups. Be aware that individual lessons tend to be pretty pricey for half or full days. Splitting the session with a friend or family makes this option quite a bit more affordable. If you are of similar level to the others in your group, this can be one of the best ways to advance and have fun. Your instructor will not only help you get better no matter how good of a skier you are, but he or she will be able to show you new trails or where the best snow is. Again, safety is a big issue in skiing. As in many activities, if you approach it safely and in an organized fashion, the chances of getting injured are greatly reduced. We already started with the most important aspect, learning how to ski. There are a few other safety tips we would like to share with you. Wear a helmet: Although the majority of skiers still do not wear helmets, do not let that deter you. The good news is that most young people do wear helmets, especially for snowboarding. Like cycling, it will probably only be a matter of time before nearly everybody wears a helmet. Why not? They are comfortable, warmer than most hats and keep your noggin from getting hurt on even minor falls. Equipment: Ski equipment is extremely safe if it is properly tuned and taken care of. The most important safety feature is the binding on your skis (obviously not the same for snowboarding). The main role of the binding is to keep you on the ski when you are supposed to be in (like while skiing) and releasing you from the ski when you are not (like when you are falling). The binding is set for weight and skill level and should be checked and set by a professional. 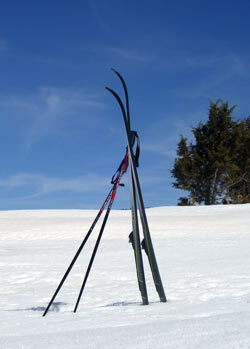 Skis also have brakes, which keep the ski from running away when it comes off. These usually are integrated into the binding and should be checked for functionality. Clothing: This is an easy one. Your jacket, ski pants, sweaters, etc. should keep you warm and make you happy. A good ski shop and a helping employee will fix you up. Make sure you spend a little extra for the quality of things like gloves and goggles. They are really important. Cold fingers can spoil a great day. If you are prone to cold fingers, mittens will be warmer. Boots and skis: Go to a good ski shop and rent a ski that fits your ability and size. If you plan on getting serious, rent from a shop with good demo skis. This way, if you like what you skied, you can buy them. Most shops will put the price of the rental towards the purchase. There are as many different flavors of ski resorts as there are flavors of ice cream. Rather than go into all the options to look for, let’s focus on some that pertain particularly to children or families. Ski rentals close to the mountain (almost always the case). Accommodations and/or rentals close to the mountain, if you are going to stay overnight or are on vacation. If you have several little ones, carrying all the skis and poles is an experience. Ski in, ski out (hotel right at the slopes) will save this experience for someone else. 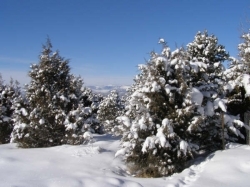 Rentals right at the mountain is another and less expensive option that solves the same issue. If neither of these are possible, approach this part of the trip with a sense of humor. Other activities close by: A day off from the slopes if you are skiing for a number of days is highly recommended. Ice skating, sleigh riding, tubing, sightseeing, thermal pools for aching muscles (depending on where you are), outdoor fire pit, music, movie theatres, etc. are all good family activities. Children will most likely find things to do in the snow if you let them frolic in it. Regardless of whether you choose to ski, snowboard or cross-country ski with your children, the experience will be well worth the effort. If you are a young adult reading this, you might want to ask you parents to consider a ski trip. There may be ski clubs in your area, from ski shops or at school, that offer special deals for kids, teens or families to take day trips to some of the smaller more affordable ski slopes. This could be a great way to start with family or friends. Enjoy the winter, stay fit, and be healthy! As noted above, skiing and snowboarding carry inherent risks. Take The Magic Step® suggests that they be learned with the guidance of a qualified instructor. Please see our disclaimer statement. © Copyright 2008-2019 Take The Magic Step®. All Rights Reserved.